The second station was sited directly below the Icknield Street overbridge and comprised a single island platform situated between the up and down Stour Valley lines. Access to the platform was via steps directly from the street, and all buildings were at platform level. The main single-storey timber building was functional and unadorned, and the roof with a low-angled pitch extended on both sides to provide awnings; these carried deep valances with a simple scalloped pattern. A small timber shed with a pitched roof stood immediately north-west of the main building. The station would continue in its role as a ‘ticket platform’ for Birmingham New Street and by 1895 Bradshaw was showing there 51 up (Birmingham direction) services on Monday-to-Friday, with 50 on Saturday and 6 on Sunday. The vast majority of the weekday services terminated at Birmingham New Street, although nine continued through to London Euston. On Sunday three of the services terminated at New Street, with three continuing to Euston. In the down direction, the 1895 timetable shows 47 services on weekdays with destinations such as Chester, Crewe, Tipton and Wolverhampton. The largest proportion of down services was shown to Harborne, with a total of 19 on weekdays, giving rise to the station’s honorary title of the ’fifth station of the Harborne Branch’. At the time of grouping on 1 January 1923, Monument Lane would come under the control of the London Midland & Scottish Railway (LMS). 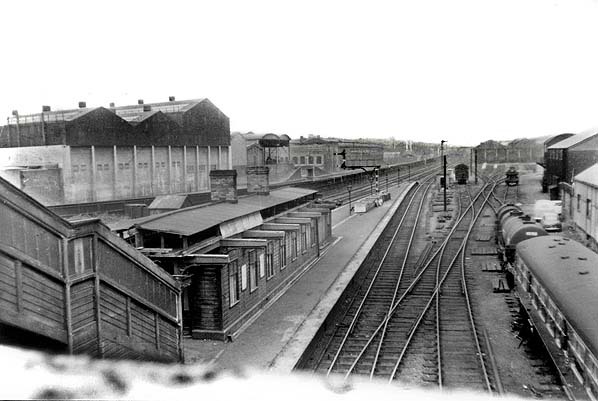 With the closure of the Harborne Branch in 1934 the level of service was drastically reduced with the station losing around 20 trains per day in each direction. During the final year of the LMS control in 1947, the timetable shows 12 services on Monday-to-Friday, 15 on Saturday and three on Sunday in the Birmingham direction (up). In the down direction there were 11 services on Monday-to-Friday, 12 on Saturday and four on Sunday. On 1 January 1948 the station came under the control of the London Midland Region of British Railways (BR). The service under BR actually improved in the Wolverhampton (down) direction, with the 1956 LMS timetable showing 17 services on Monday-to-Friday with 15 on Saturday. In the opposite direction the level was pretty much the same as it was in 1947 with 11 services on Monday-to-Friday and 12 on Saturday. The most notable change was the withdrawal of the sparse Sunday service. It seems that BR did not install totem name signs at the station. By the late 1950s the writing was on the wall for the station, with competition from buses and the affordability of the private motor car. BR announced the station would close during 1958 and there seems to have been little notable opposition to the closure. Monument Lane closed on 17 November 1958 and would be quickly demolished. 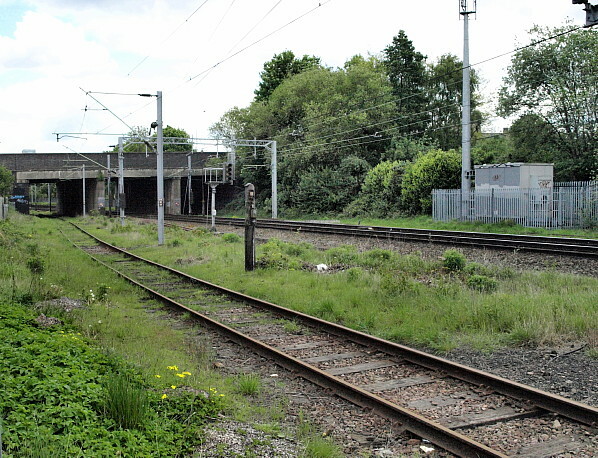 Today there is little evidence of a station ever being at this location, with the Icknield Street overbridge having been widened to form Ladywood Middleway, wiping away any trace of the station entrance. A swathe of land is still apparent between the up main and the through siding where the platform once stood, which is the only evidence of note that a station was ever here. Bradshaw's Rail Times for Great Britain and Ireland December 1895. 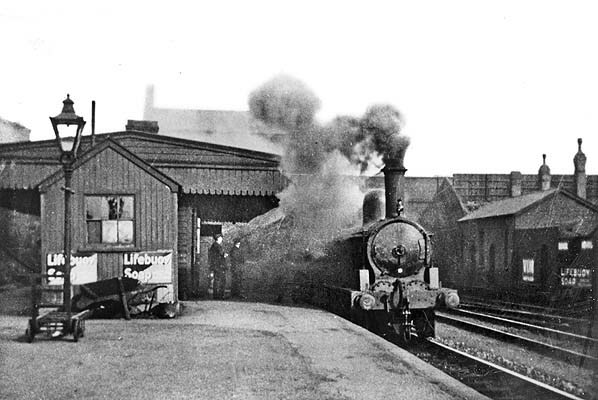 An LNWR 1F 0-6-0 tank engine makes a smokey start from the station on a local working. The station seen on the 1889 1:500 town plan the lines running into the coal wharf can be seen to the bottom right. The 1955 OS 1:2500 map shows the close proximity of the Birmingham Canal to the station site. 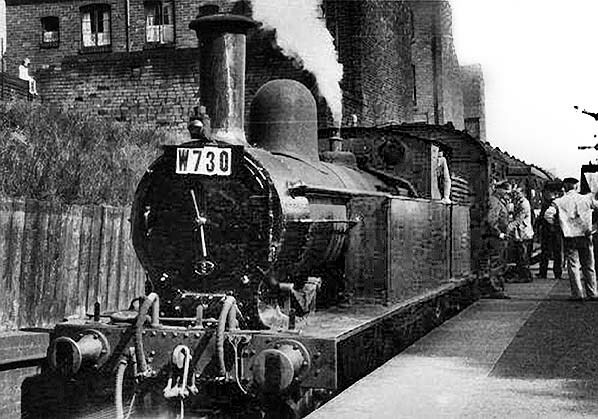 An LNWR Webb 1P class 2-4-2T No 46757 was given the honour of hauling the first passenger service in 16 years along the Harborne branch and is seen here on 23 June 1950 at Monument Lane. LMS Derby built Royal Scot class 4-6-0 heads a lengthy express at the Birmingham end of the platform during June 1955. The extensive coal wharf sidings can be seen to the right of the train. 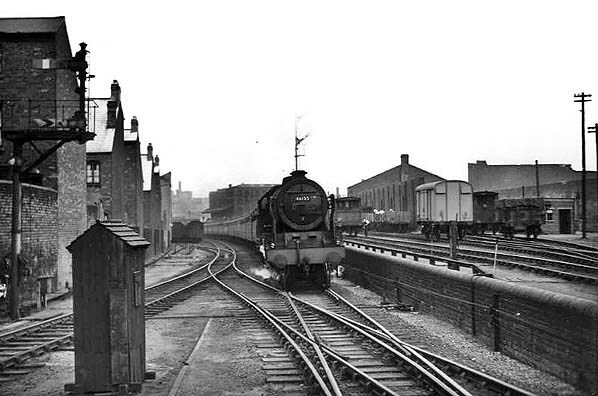 A lengthy mineral train is seen at the west end of the station during June 1955 about to pass through on the up goods it would probably run into the coal wharf sidings. To the right Monument Lane carriage sidings shed can be seen latterly used to stable DMU sets. 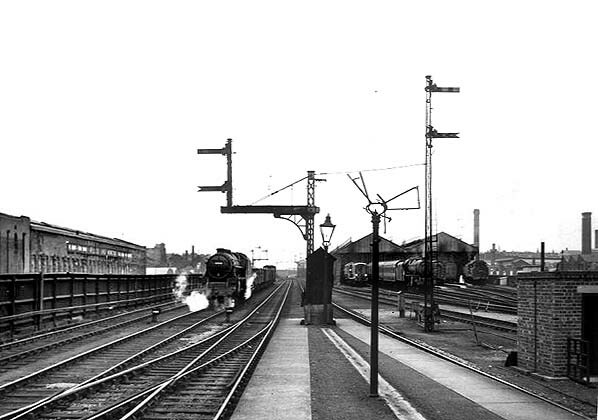 The station seen in 1959, following closure the signage and platform canopies have been removed. Viewed from the opposite side after closure the timber buildings and platforms would be demolished shortly after. The station site today seen from the Ladywood Middleway overbridge on 14 May 2014. 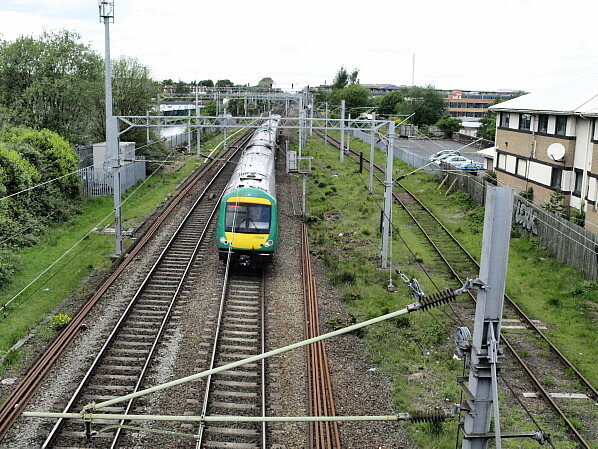 A Class 170 unit working towards Birmingham New Street is passing the site of the platform which is marked by the unoccupied seathe of land to its right. Looking towards Biringham from platform level the line closest to the camera is the up through siding which, although wired looks to see little use. The line would have been the up main in days gone by with the line to the right being the down main.